The recent death of American author Philip Roth provided a reminder about how many passionate followers he has in Greece. The news of his passing was followed by numerous effusive tributes in the local media and laudatory comments on social media. Beyond the obvious reasons for which Roth was so highly respected as an author in his own country and other parts of the world, it is difficult to understand exactly what aspect of his writing prompted such a dedicated following in Greece. Perhaps it was because he provided a consummate insight into the inner workings of the USA, a country that Greeks have had an all-consuming love/hate relationship with for so many decades, that Roth’s work was so valued here. However, Roth’s considerable and ardent following in Greece, an admittedly small market for internationally-renowned authors, always seemed incongruous given the pronounced differences between Greek and American societies. The relevance of his writing to our condition seemed limited in most cases. One of the few exceptions was The Plot Against America, a counterfactual take on history in which Nazi sympathiser Charles Lindbergh beats Franklin D. Roosevelt to the US presidency in 1940 and a wave of anti-Semitism and ultra-nationalism sweeps the country. Published in 2004, the novel has gained relevance over the last few years due to the rise of the far-right in Europe and the US, especially within the context of Donald Trump’s victory. Whether Roth expected it at the time or not, many parallels can be drawn between his fictional recasting of history and today’s political situation in numerous western countries. Although Roth has Roosevelt make a comeback to become president, by taking us on his trip to the edge of darkness, the author has already driven home his point. 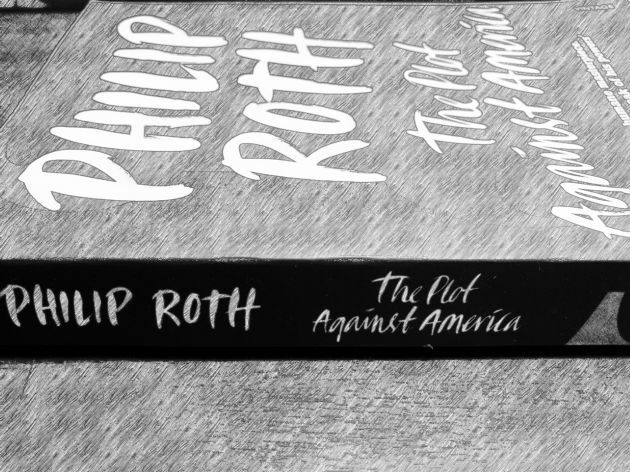 Perhaps the most frightening aspect of The Plot Against America is the plausible way in which Roth describes the insidious spreading of hate in his country, detailing not just how the masses are taken in by a celebrity leader but also how those who are savvier are either happy to go with the flow or too fearful to resist. There was an element of irony to the MP’s intervention given that one of the reasons why such attacks take place is because personalities and politicians who hold extreme views are given a platform in Greece, often by the local mainstream media, to spread their hate. Georgiadis fell into this category in the past but over the last couple of years he has tried to make recompense for targeting Jews with his rhetoric. Georgiadis began a public effort to build ties with the Jewish community in January 2017, when on Holocaust Memorial Day, he admitted that in the past he “coexisted with and tolerated the opinions of people who showed disrespect to my Jewish compatriots” and apologised to Greek Jews. “I firmly believe that anti-Semitism does not and should not have a place in our democracy and in our culture,” he added, explaining that he had learnt much about the Jewish people and their history over the previous years. Until joining New Democracy in 2012, Georgiadis was an MP with far-right LAOS and has was known for promulgating conspiracy theories and offensive books, such as “The Jews, The Whole Truth” by Konstantinos Plevris, through his other job as a bookseller and TV personality. In 2013, when Georgiadis was appointed health minister, the Anti-Defamation League wrote to then prime minister, Antonis Samaras, to complain. Apart from promoting, Plevris’s book, in his pre-New Democracy days Georgiadis also endorsed numerous anti-Semitic smears. It appears that since then, Georgiadis has undergone some kind of transformation that has prompted him to publicly acknowledge the error of his ways. This change is welcome, especially in a country like Greece, where there are strong anti-Semitic roots. What has been disturbing, though, is the collective enthusiasm and unquestioning manner in which many journalists and commentators have accepted this change of tack. Firstly, Georgiadis did not just “coexist and tolerate” hateful views, as he said in his apology last year - he actively promoted them. Given this was his starting position, he has a long way to go before anyone can be sure he is making a genuine effort to atone for the past and is not involved in a public relations exercise driven by political expediency. After all, it is not unusual for far-right politicians in Europe to tone down their anti-Semitic rhetoric. Marine Le Pen and Gianfranco Fini are among those who have tried to clean up their image. Fuelled by Europe’s struggle to manage immigration, Muslims have become an increasingly popular scapegoat for the continent’s far-right leaders, such as Geert Wilders, who has tried to cultivate close ties with Israel. In this broader context, any effort by a politician to apologise for the extreme and hateful views he or she held should be treated with caution. It must be clear that the transformation has sincerity and longevity, rather than being a political stunt to gain broader acceptance and more power. Perhaps even after his death, there is much that Greek readers can discover in Roth’s books. Maybe the relevance is not always obvious, but it can be found if you look in the right places.